I met Andy Varipapa in the early 1960’s at Lewis and Clark bowling lanes in Seattle, Washington. I happened to be the highest average bowler at L & C lanes and I was selected to bowl a three game exhibition against Andy in the evening. I do not remember the exact date, but the place was packed. I lost to Andy that night, but we both shot over 650. I was looking at all the stuff that I had accumulated and found a picture of Andy that he autographed and gave to me. Bob – Thank you for your post, apologies for the delay in my response. I researched some history on the Lewis and Clark complex. An elegant movie theater built at a time when Sterling made grand theaters in the suburbs to replace the declining use of city theaters as well as smaller neighborhood theaters due to the increase of television use. Not only did the theater provide swinging seats, but the balcony had a reserved section in the first few rows used for people that came in late to the movie so that they didn’t cause that much of a distraction (even though the area was supervised by ushers and swinging gates. It also included a state-of-the-art 32-lane bowling center, which was just as elegant as the movie theater was. It was built in 1960 and it used the white Brunswick design with the dual lane configuration that was known for its artistic design for the time. 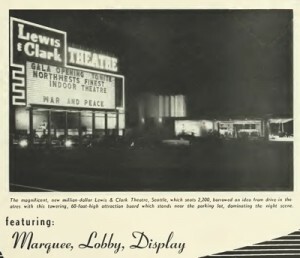 The Lewis and Clark Theatre complex was closed by Cineplex-Odeon in January of 2004, and briefly served as a church until it was demolished in 2005.